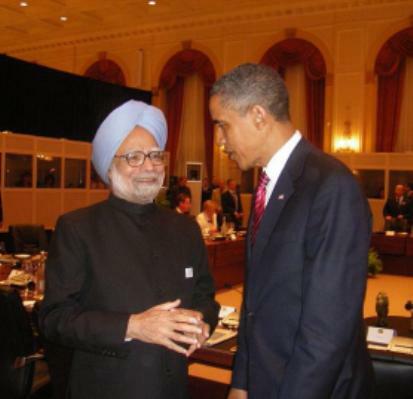 Prime Minister Dr. Manmohan Singh met US President Barack Obama on the sidelines of G-20 Summit in Toronto on June 27.Following is the transcript of the remarks by the two leaders before their meeting. President Obama: I want to express my pleasure having the opportunity to meet once again with my good friend, Prime Minister Singh. I said before and I continue to believe that the extraordinary leadership that Prime Minister Singh has provided not just to India, but to the world, has helped us navigate through some very difficult times. And I can tell you that here at the G20, when the Prime Minister speaks people listen, particularly because of his deep knowledge of economic issues, as well as the fact that he understands that as India rises as a world power, not just a regional power, that it also has enormous responsibilities to work with the rest of the world community around issues of peace and prosperity. The last time that Prime Minister Singh visited the United States, as part of a wonderful State Dinner, we instituted what we termed a strategic partnership that involves all of our ministers at the highest levels working together to try to find ways to enhance commercial ties, security ties, coordination on critical multilateral issues like climate change. And as a consequence, Minister Krishna led a delegation to Washington to follow up, and working with Secretary Clinton, conducted some very high-level talks. I had the opportunity to participate in that dialogue. We also wanted to make sure that in addition to government-to-government ties, we were initiating people-to-people ties, and so an Indian-American CEO conference took place. And we’re going to continue to see how we can get our businesses to work together, and then generating recommendations to each of us in terms of how we can improve ties between the United States and India. I am very pleased to have accepted a visit on behalf of myself and Michelle to India. It is a trip that I’m very much looking forward to, and I know that the Prime Minister and his gracious wife will extend great hospitality to us. We are also just excited because of the tremendous cultural, as well as political and social and economic examples that India is providing the world and has in the past. So, Mr. Prime Minister, thank you so much for your friendship, and we look forward to working with you in the months to come, leading up to the visit, so that we know that we’re going to have a very productive stay when we’re in India. Prime Minister, Dr. Manmohan Singh: Mr. President, thank you very much for your warm words. I attest that India attaches the greatest importance to this relationship with the United States, with which we have a steady partnership. It is our common endeavor, Mr. President, to give this strategic partnership a new thrust, a new meaning, a new content. And it’s my privilege to be associated in this global endeavor with you, Mr. President. You are a role model to millions and millions of people all over the world. Your life history is a history which inspires millions of people everywhere where there are people who have risen by the sheer depth of their austerity, of their hard work, and their commitment to the values on which you have worked and you’ve stood for. It has been my privilege, Mr. President, to enjoy your friendship, and this is something which I will cherish forever in my life. The dinner that you hosted for me and for my wife last year was a most memorable evening for both of us. And we look forward to your visit, the First Lady’s visit, and your children’s visit to India later this year. A very warm welcome awaits you, Mr. President. And I have every reason to believe that you will find it a productive and exciting journey to a country of India’s diversity, of India’s complexity. And we are engaged in getting rid of chronic poverty, ignorance and disease, which still afflict millions and millions of our people. And it’s our common desire to work together to get rid of this scourge in our lifetime. And in that, the United States’ support means a great deal to us. Your personal commitment to social justice is something we cherish. And I look forward to have the privilege of welcoming you and your family to our country so that you can see for yourselves what we are trying to do, the difficulties of managing social and economic transformation in the framework of a democracy committed to the rule of law, committed to all fundamental human freedoms. I think that’s what India seeks to achieve. And in this, we seek your active involvement and active participation. Thank you very much.